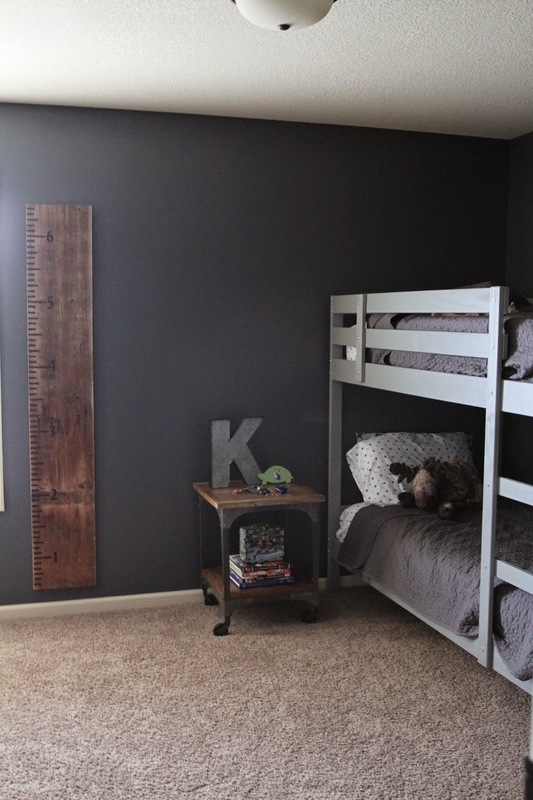 For awhile now I have been wanting to really pull the boys' rooms together. 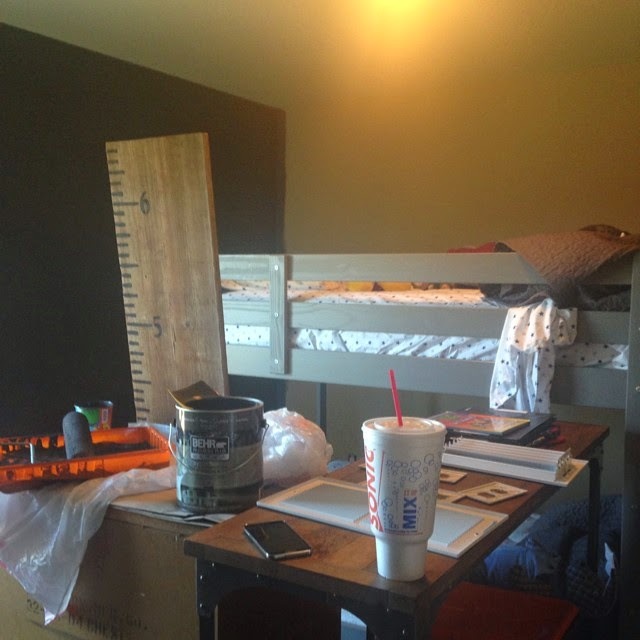 They have never really had a finished room and although we aren't 100% there, I would say we are about 90% there in Kaden's and about 80% in Logan's. We only lack curtains in each and wall decor--mostly in Logan's but I do need one more for Kaden's room and I actually have it all picked out, I just need the shop owners to return from holiday break! The first item on the list was to pick out a few more pieces of furniture for Kaden's room. After having painted the bunk beds I watched the sales at World Market because they had the perfect nightstand and shelving unit. Finally they went on sale and I snatched them up but they sat pretty empty for a few more weeks, okay, maybe two whole months. Next up on the list was paint & I just couldn't decide what direction I wanted to go. I wanted something grey but with the trim in our house being more of an off-white or beige I knew it had to be the right grey. So I sat on it & then one day brought it up to my co-worker and she pretty much dropped it in my lap. I mentioned I wanted to go a darker grey and she walked over to her office and came back with a tester can of Peppercorn by Sherwin Williams. I went straight home, painted a large spot behind the door in Kaden's room and just stared at it over the next few weeks. In the end, it was just paint and there was nothing to lose. Worst case, I'd have to paint over. Justin and I both decided that we would take a little time off from work over the holidays. We would have from Christmas till after New Years off & this would be the perfect time to get a number of house projects done. The boys would go to Ms. Brenda's a few days that week and we would roll up our sleeves and get dirty. Luckily, the color was perfection--at least in my book. It took about two days, two coats, lots of painters tape and my iPhone playing early 2000s rap to complete Kaden's room. & when it comes to paint drying, I am not the most patient. It's either I am ready to check it off my list or just eager to see it all come together that as soon as I believe the wall is dry, the outlet covers and anything that was hanging on the wall goes back up. 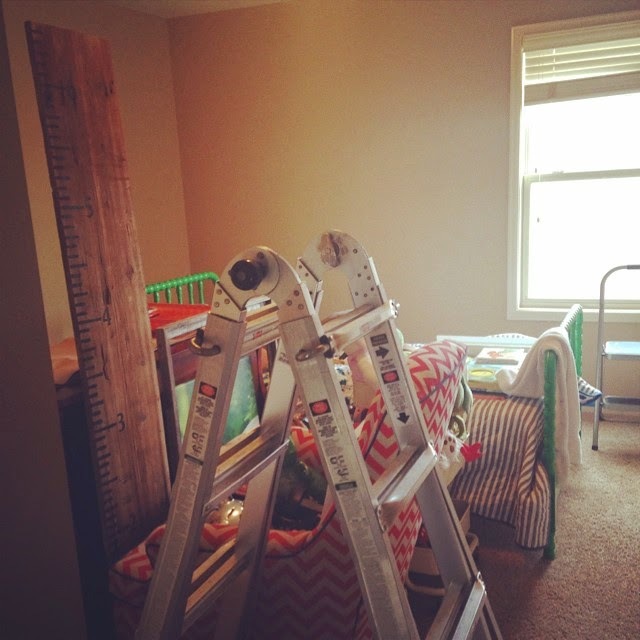 The whole goal of this room was to have a room that Kaden could continue to grow into. I didn't want anything that was focused too much on any one theme, I wanted a room that we could easily add/remove a few things here and there to change the "theme" of his room. Everything that ended up back in his room were all things we already had around the house that we weren't using. 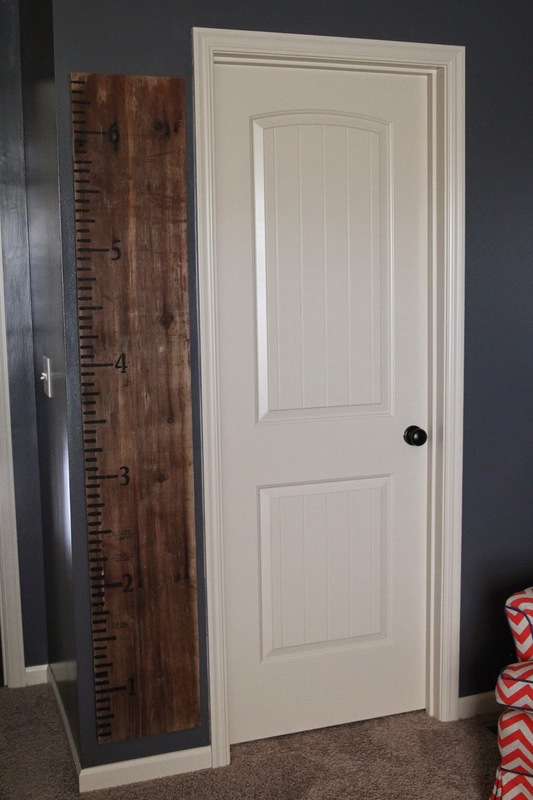 His growth chart from my Grandpa Earl's barn that sits on our farm on the corner of Country Rd 100 & K hwy. Superhero books with a metal Ninja Turtle lunchbox. His BIRTHday print, his piggy bank that was given to him at his first baby shower and then the Bunny. The bunny is probably the most treasured piece in his room right behind the growth chart, hell, probably tied with it. The Bunny is made from clothes and overalls that my Grandpa Earl wore. There wasn't a day that went by that he wasn't in overalls and had something plaid on. This Bunny is a daily reminder that Papa Bob is still with us and watching over all of us. These bins were actually meant for something else but for one, I haven't found that something else yet and two, my mom had the great idea of putting them in here. 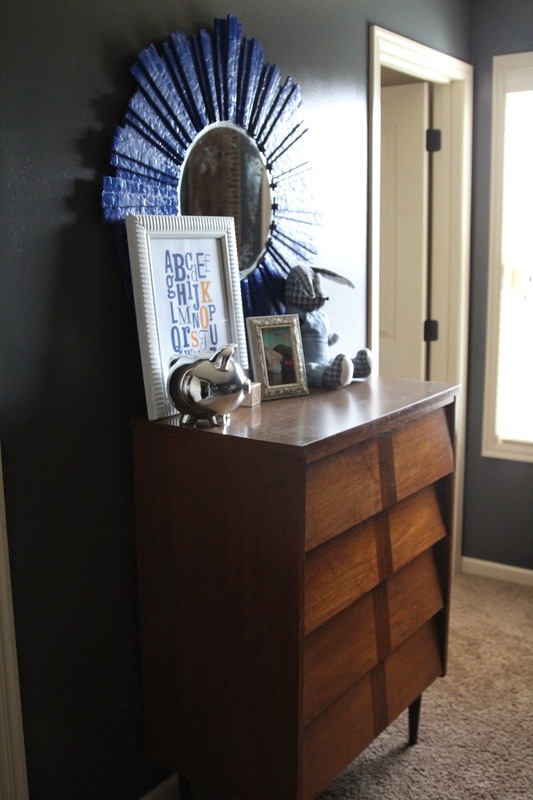 I was already trying to find some bins that would fit nicely here and work the metal & wood theme we had going on and when she mentioned using these it was like a no brainer. 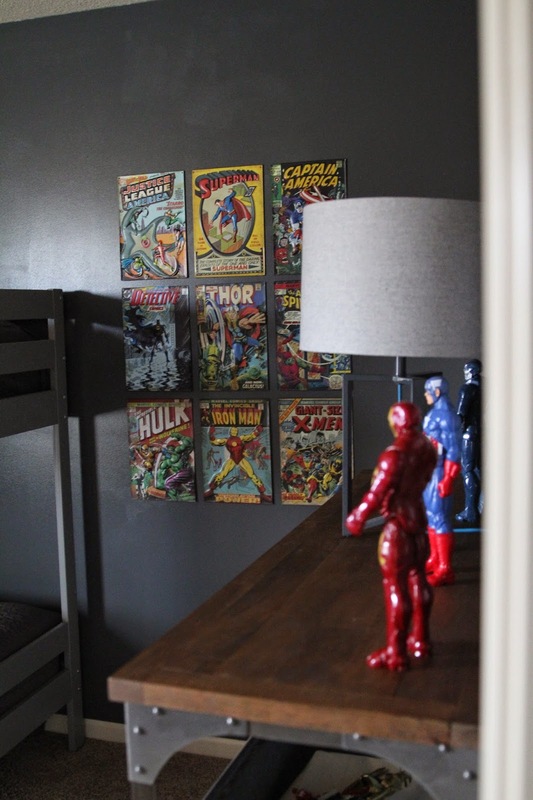 And thanks to Command Strips---LOVE these---I was able to pull these 9 metal Superhero comic book tins from one wall and re-adhere them to this wall. By moving these over to this wall it left the space above the shelving unit open & I knew exactly what I wanted to go there--a couple canvases from Kaden's 5 year old Huck Finn shoot. & a few Superheroes. Finished it off with a basket full of his stuffed animal friends and we have a 90% finished room. He was so excited when he saw it all done. & Logan kept saying, Wow, this is AWESOME, Kaden. I wish my room was like this. And even though I was already planning on painting Logan's room, I wasn't going to do it for a few more weeks. You know, give myself a little break. But I couldn't disappoint my littlest guy, so I went back to work. I won't lie, I wasn't looking forward to painting another room but I knew that when I was done and Logan got to see it that his smile would be worth it. Oh, it was & then some. 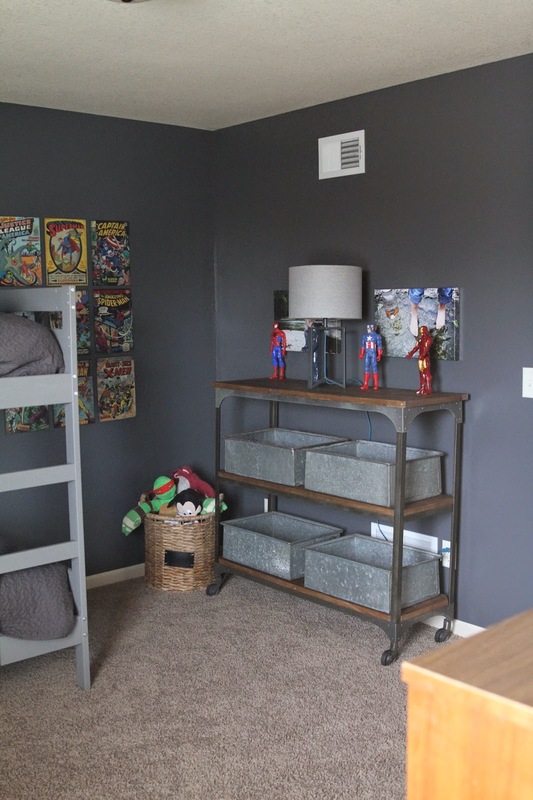 Unlike Kaden's room, Logan's doesn't really have a theme yet. I started to do a nautical theme but then I wasn't really digging it so basically it's evolving. We will get there, some day. What I do know is that this is one of my most favorite images of Logan. This is from when he was 10 months old and was taken in the front yard at our old house. I love his full, chubby cheeks. His cute little pout. & his BIG blue eyes. Like Kaden, Logan has his BIRTHday print and a piggy bank from one of his showers. He also has a picture of his Daddy and I in his room which is in a frame from their original nursery theme. His Dad and I were just pups in this picture--summer of 2007 maybe. As you can tell, I have a thing for rustic items. & I love mixing textures. 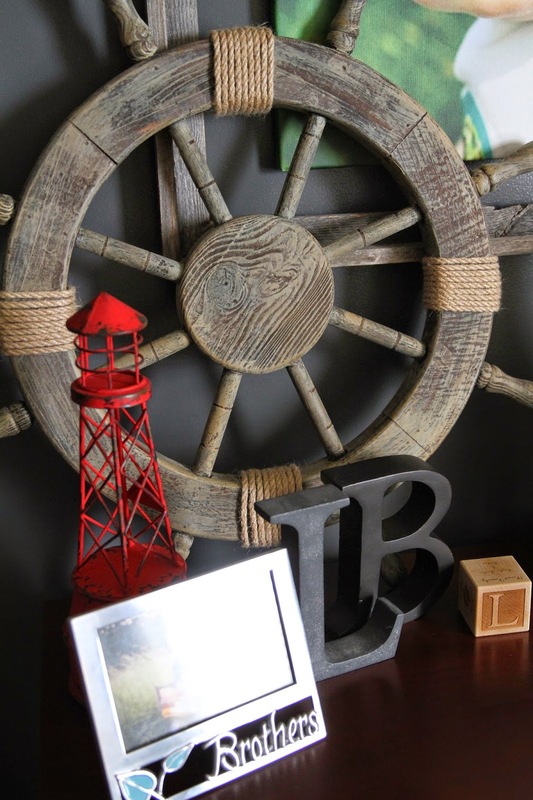 The rustic frame, the rope wrapped helm, a little rustic red light house, a metal L & B. 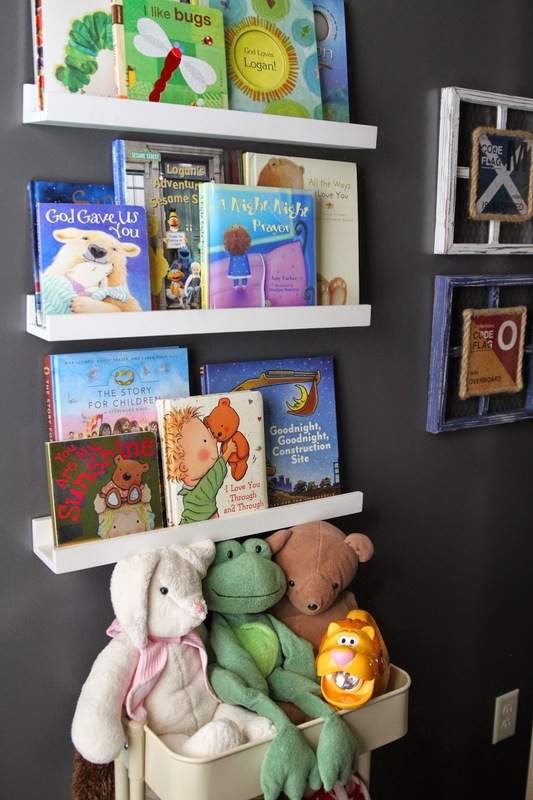 We also have a little reading nook in Logan's room. It's not new but the cart of animals is. Logan loves his stuffed animals and he has a number of them which mean a lot to us so we like to have them out in plain view. The green froggy was Logie's first stuffed animal, he use to carry it everywhere with him. The bear next to Froggy is Justin's bear from when he was little, Logan named him Daddy Bear. & then there is the Bunny with a pink vest. Yes, Logan has a pink vest wearing bunny in his room---and it has a similar story to the one in Kaden's room. This pink bunny happens to be made out of my Grandma Hartley's robes that she use to wear. So there it sits, watching over Logan and really, all of us. And then there is the growth chart. The one from Grandpa Earl's barn. Yup, Logie has his own too, although missing a few marks--I'm a tad behind. A New Year and two new rooms for the boys. Minus curtains and some wall decor. Now, what color to paint ours?!? !